Hello everyone! 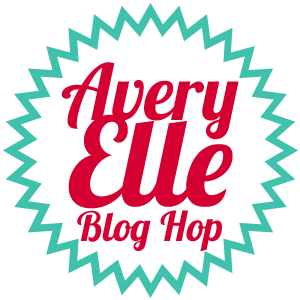 It's time for the Avery Elle February/March Release Blog Hop! The previews have been rolling out on Avery Elle blog all week and they are available in the store right now! Today, I'm working with the Simply Said Hello word die and coordinating stamp set! This new word die is very similar to Love die that came out last release (which is awesome;). Here's my first go at it! All the loops in the word die got me thinking about how I could incorporate them into a design. So I thought, let's try embroidery thread:) I love how it turned out! And the coordinating "sunshine" stamp was the perfect addition. I stamped it with the new Avery Elle white ink and look how vibrant it is! Love it! Very white, white! For my next card, I did a technique I like to call stacked stamping. You've seen me do it a number of times before (such as here, here, here, and here), but this time I had 3 different layers. The card base, the word die, and the angled reverse cut panel (whew!). 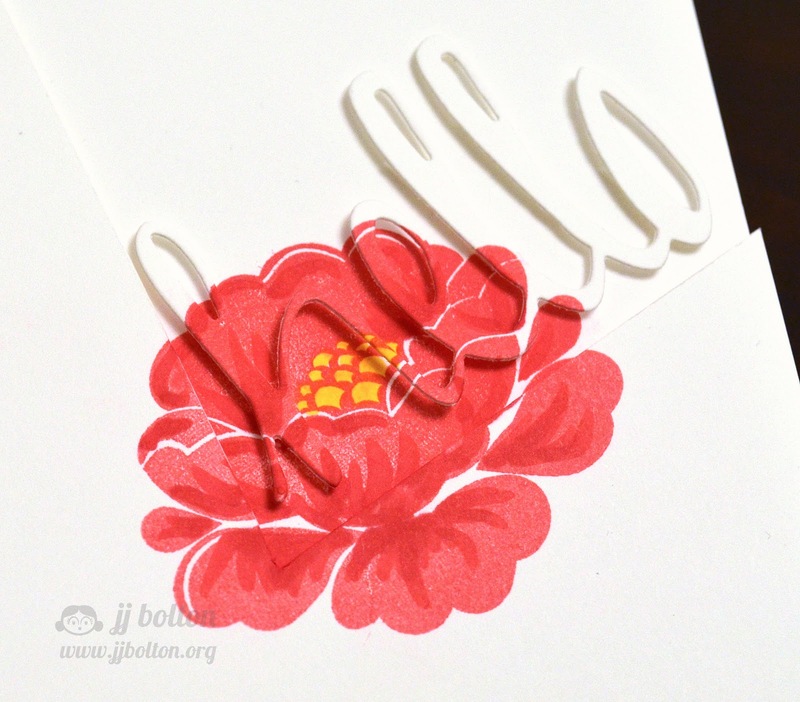 The flower stamp is from the set Petals and Stems and it's one of my faves! All 3 parts were done separately (with the help of a stamp positioner) but they were all colored with a Copic at the end. This last step with the Copic really brings depth and makes all 3 pieces come together. Here's a close up of the die cut stacked over the card base. Love how it blends in! 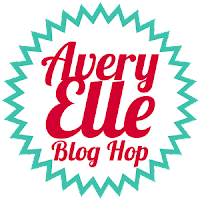 And of course, to celebrate our February/March Release Blog Hop, Avery Elle is giving away a $25 Gift Certificate to one random winner. To enter to win just comment on this post. There is no purchase necessary and you must be 18 years of age or older to enter. This giveaway is void where prohibited. You can also do options 2, 3, 4, 5 or all 6 of the following to increase your chances of winning. You have until midnight Sunday, February 9th to enter. The winner will be announced on the Avery Elle Blog on Monday, February 10th . All products are available for purchase in the Avery Elle store right now. Absolutely love both your cards, JJ. I was just looking at the Hello die in the AE store and here you show an unique way to use it. The Copic markers add a lot to the flower on one of my favorite "JJ techniques" you used on the second card. Beautiful cards, JJ! Thank you for the inspiration. I am already a follower on Pinterest. I am already in your Avery Elle Gallery group on Flickr. Wow… two amazing cards, both with brilliant color! LOVE! You are so creative! Fabulous techniques and designs! Thanks for the inspiration. Oh Gosh! These are both so awesome! Wow... what you do with a simple die! I love your creations and you give me a lot of inspiration. Very pretty cards! Loving all the great ideas! Wow! Your cards are stunning. I can't wait to get my hands on some of these stamps and dies so I can try these techniques myself! The cards are fantastic. I loved the word anchored by the embroidery thread. The stacked pieces on the flower card are wonderful. I don't think I had seen that technique before but it is one I will try. Love both cards. Thanks for sharing some inspirational ideas for my next cards. WOW -- your cards are so unique -- I don't think I've ever seen such techniques before and they are simply smashing! LOVE that colored flower! TFS!!! Such fun cards! Loving both of the techniques! WONDERFUl use of the twine and I lurve the second card!!!! OMG, both are so creative! LOVE the flower!! AWESOME, love those rainbow strings, and your second card with the angle, die cut and flower stamp is just FAB! I'm stunning with your cards, there are amazing! Fantastic cards! Such creative uses of this new die-cut!!! Your a genius! Using the thread that way is so clever and makes for a stunning card. Well done you!! Oh my goodness... I absolutely love both cards!!!! They are just beautiful!! Leave it to you, JJ to come up with jaw dropping, cool cards! These cards are so different looking, but both so amazing! TFS! WOWZA!!! I wish I had your talent! Very creative ways to use this hello die. These are both fabulous, JJ! I love the string on the first one! These cards are just genius! I LOVE them. The best part is that when I case them, people think I am a genius - LOL! I love the rainbow strings. What a happy card! Delightful cards! LOVE that hello die!!! 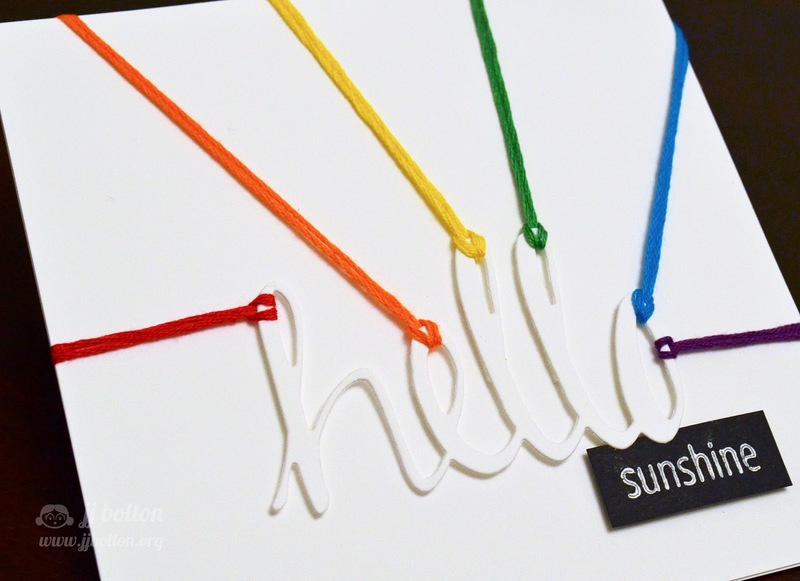 Very clever card with the rainbow colored strings! The first card is so fun and clever and the second one totally knocked my socks off...wow! Wow! These are so creative and unusual. Great inspiration. Love them both. You are amazing! These are awesome. That flower hello card is a wonder! 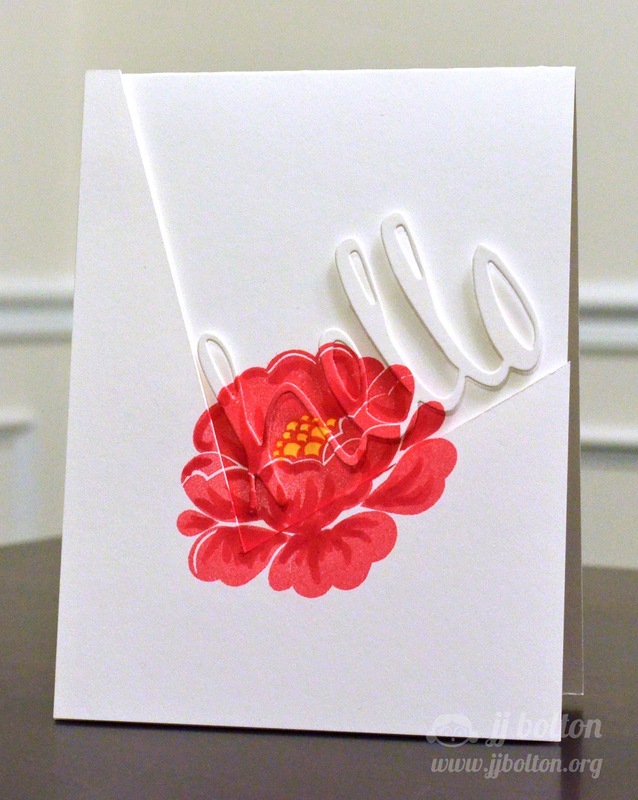 I absolutely love the stacked stamping card with the flower! The new release looks fantastic! I can't decide which card I like best. They are both fantastic! thanks for the inspiration. Um, that first card is just so cool, LOVE!!! And I'm glad to see the return of the Bolton technique, the second card is fantastic! The detail pic of the Copic coloring with your stacked stamping technique just had me saying "Whoa!" out loud to myself. :) Amazing cards! Fantastic cards. What amazingly clever designs. Love that diecut. You did a wonderful job showing different ways to use and embellish the die cut. Beautiful Card! Love how you tied the different colored twine to the die-cut letters. Really neat idea for your first card! And you second card is so beautiful, I love how it turned out. Thanks for sharing.